This first card was quick and fun. 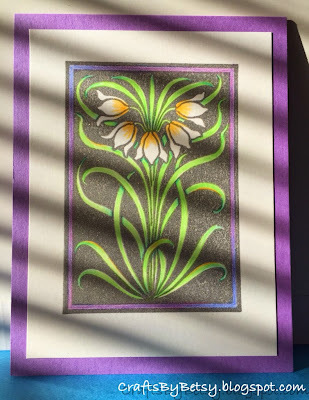 The beautiful negative image stamp is from JudiKins and I stamped onto white cardstock with Lightning Black Brilliance ink (the shimmer doesn't show up in the photograph). 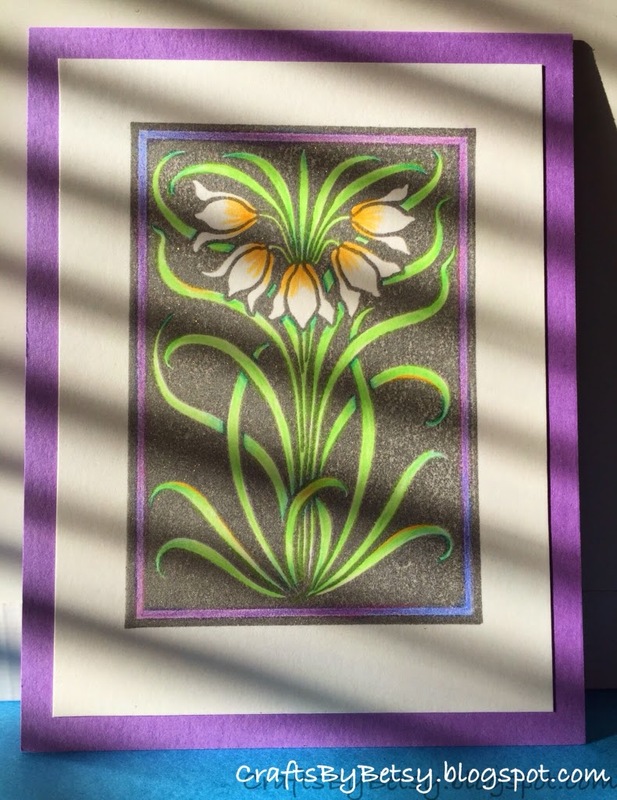 I added colored pencils, cut to mat and added to a standard A2 card base. It's a beautiful image and just a little color adds so much. I tried finding it on the JudiKins website, but it's not currently listed so I guessing it's out of production (stamp#2683H). **UPDATE** I missed it! The stamp is available and you can find it at page 64 of their PDF catalog here. And here is a link to their order form too. Take a look at your negative space stamps as I'm guessing this technique would be suited for most of them. We finally had a sunny day, so I couldn't resist taking the photo with the shadows from the sun playing across it. 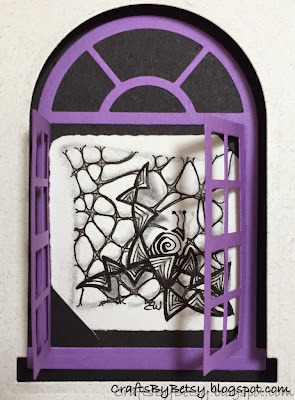 Next I had some Zentangle® fun with Bijou. He loves the slowness of "snail mail" so it seemed so fitting that he join in! Before I knew it, I had 5 tiles done! 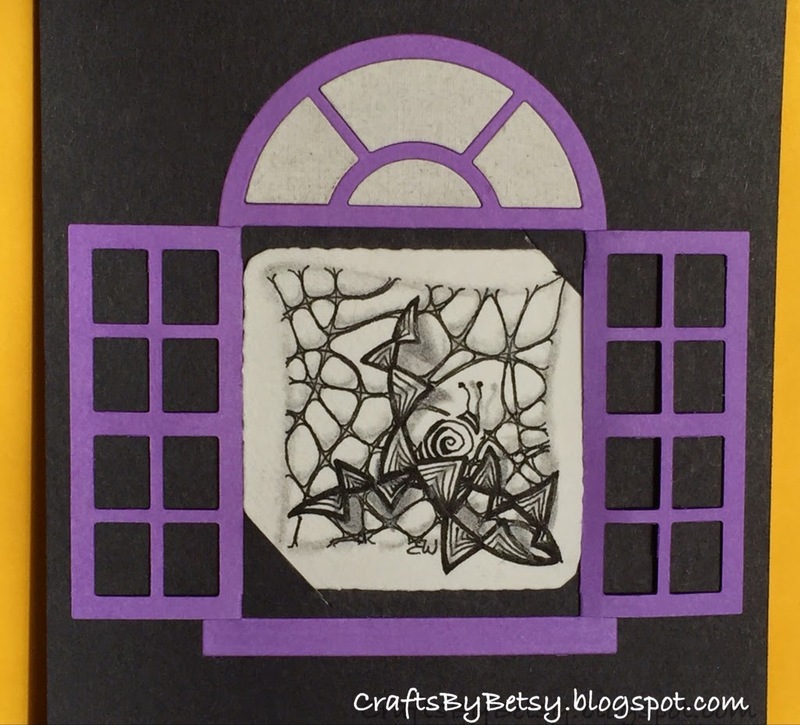 I got the idea of layering the tile onto a card from seeing several of you adding a Bijou tile to the center of your standard Zentangle tile. Great idea! Here's my spin. I have a Cuttlebug embossing folder that also cuts (the square cutout) which was a perfect fit for Bijou. I embossed a piece of color core cardstock by Core'dinations which was black with blue for the core, so when I sanded the embossed image, the blue was revealed. 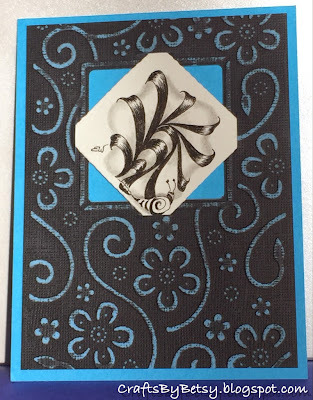 I added the embossed and sanded piece to a blue A2 card base. Nice technique, but messy. The tangle is Aquafleur. 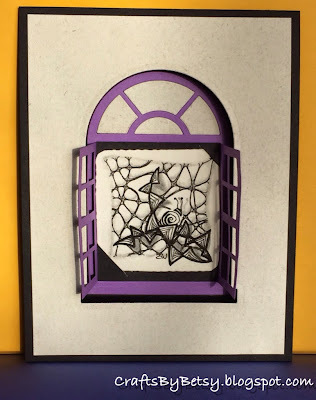 I cut slits so Bijou can be removed or swapped out for a different tile or photo etc. I have more Bijoux so I need more cards! At the time of this post I'm still working on more, but so far, this is the only other completed card. 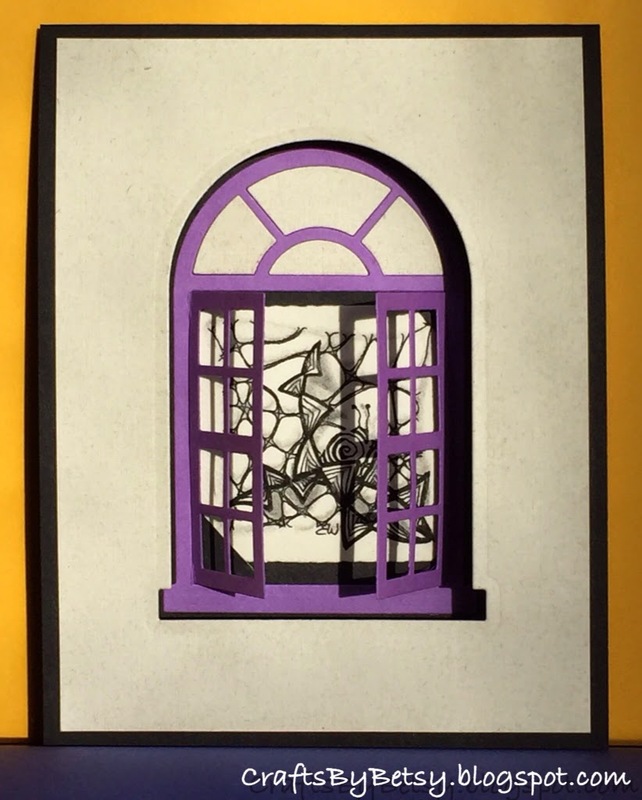 It uses a Spellbinder's window die. This one is quite interactive and tricky to photograph. Here are a few different perspectives so hopefully you get the idea. 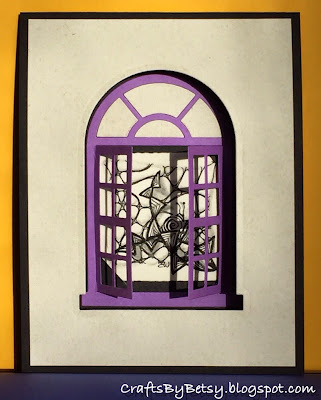 The front of the card has the arched window cutout and the purple window is actually attached to the inside of the card. The shutters can be either inside or pop through the front of the card. 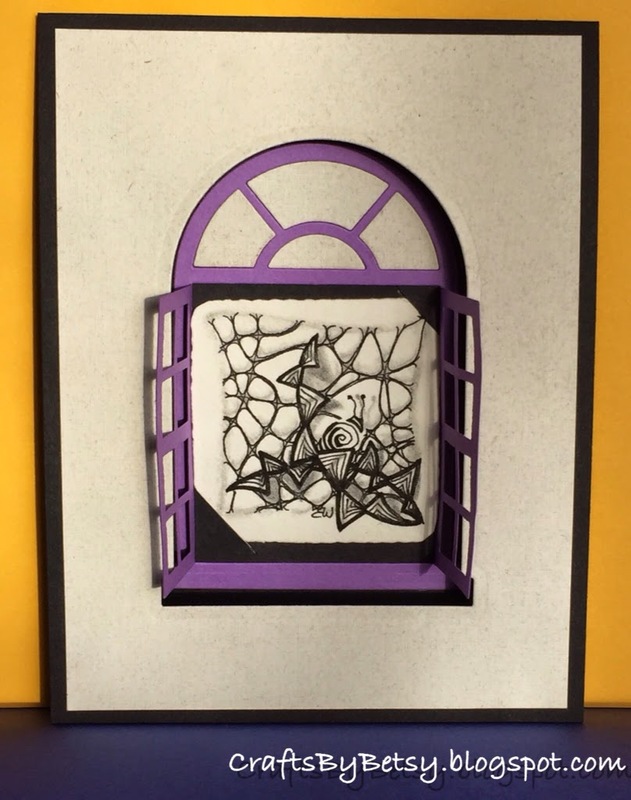 Bijou just barely fits in this window, but you can also change out this tile. Tangles 'Nzeppel and Rain (with Maryhill). See you next week. Thanks for your wonderful comments!